The Moderators Europe team are all accomplished Television and Radio journalists and presenters who are very experienced conference moderators and facilitators. All have worked for the BBC and other leading broadcasters across Europe, and have a detailed knowledge of European affairs. 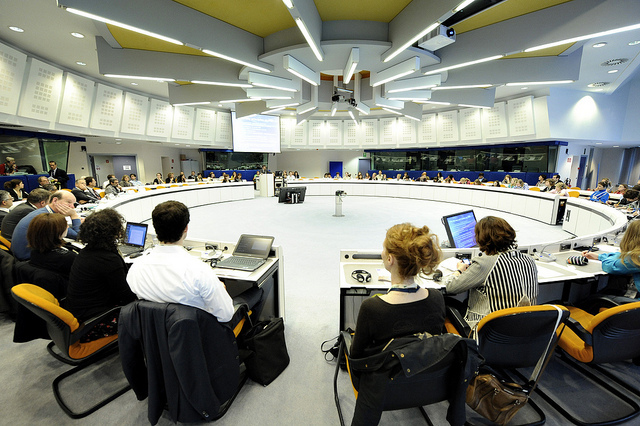 Arranging a European conference or seminar can be a complex, time-consuming and expensive task. But all the careful preparation work can be wasted if the event itself fails to engage and involve the audience, with speakers overrunning their time, lack of clarity for the listeners who do not have English as their first language, rambling discussions, and no clear outcomes. The members of Moderators Europe will ensure that a conference runs smoothly to time – with bright, engaging and instructive sessions, lively and inclusive debates, and a clear focus on meeting the objectives of the organisers – achieving enthusiastic feedback from participants. European specialists. We are enthusiasts for communicating the European project and have a wide range of specialisms in European Affairs, including political and social issues, business and innovation, the environment, climate change, development, citizens’ rights and communicating the EU. Fluent speakers. Moderators Europe speak clear ‘BBC English’ and some additional European languages. With many conferences being conducted in English, we know how important it is to avoid speaking too quickly, allowing all listeners and interpreters to follow easily. Anywhere in Europe. We can travel to events across Europe. Members of the team are based in Belgium, Italy, Ireland, Switzerland and the UK. Sensitivity. The members of our team are sensitive to cultural and political differences across Europe. Planning advice. Our experience of many conferences means we can help with planning an event, advising on formats, details of logistics and speakers’ presentations. Independent journalists. Having an independent journalist to moderate a conference or round-table changes the dynamic of the event, encouraging dialogue with the audience and allowing speakers to be challenged or questioned – firmly but politely of course!